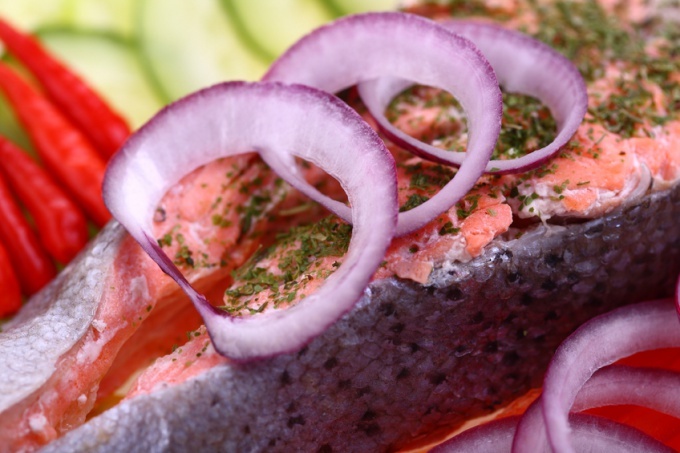 Salmon refers to salmon fish, also known under the name of Atlantic salmon. Salmon contains a large amount of useful minerals. It is an invaluable source of fatty acids Omega-3, which is necessary for the prevention of atherosclerosis and cardiovascular diseases. Vitamins and minerals contained in even a single serving of Atlantic salmon, can significantly improve the brain activity of a person. Therefore, dietitians recommend to include in your diet fish dishes at least 2-3 times a week. There are many ways of cooking salmon. When buying fish at the store be sure to pay attention to its freshness. It should not have an unpleasant smell. When pressed with your finger on the pulp, it must be sufficiently elastic and fast recovery form. If there are doubts about the freshness of product, it is better to abandon the purchase. It can be dangerous to health. Prepare the fish for cooking. Rinse thoroughly in cold running water. If necessary, cut into serving pieces. To the steaks turned out juicy, tender, with a spicy aroma of spice, they must be pre-marinated. It's enough to put them in a glass or enamel bowl, season with a little salt, add pepper coarse grind and pour over the juice of half a lemon. Cover and leave in a cool place for 15-20 minutes. Meanwhile, slice the other half of the lemon and tomato thin slices. Make a foil "boat" sized pieces of fish: cut a piece of foil and zasypnica edge on two sides so that the design resembled the shape of a boat. Put "boat" of foil on ovenproof pan. In each of them, put the salmon steak, if necessary, add salt and pepper. Top fish put sliced tomatoes and lemons. Pour cream to cover the piece of fish to half. Carefully place the pan in the oven and bake at a temperature of about 200 degrees Celsius until cooked. When serving a steak of salmon can be served with fresh parsley and dill. As a garnish to this dish is ideal with fresh boiled potatoes or steamed vegetables — broccoli, baby carrots. You can also put the slices are boiled until soft potatoes in foil boats in which to bake the fish. It must be done before adding the cream. In this case, you will not have to separately prepare a side dish. The dish is initially cooked as a La carte.